The thyroid gland is a butterfly-shaped organ located just below the larynx (voice box). It is part of the endocrine system — the body’s chemical (hormone) messaging system. Although it is relatively small, weighing only about 25 grams, its performance impacts every cell, tissue, and organ in the human body by regulating the body’s metabolism — the process by which the body extracts and uses energy from food. Hypothyroid: Underactive thyroid. The thyroid produces insufficient amounts of T3 or T4, which results in extreme fatigue, brain fog, weight gain, coarse hair and nails, hair loss, facial swelling, constant aches and pains, constipation, depression, poor sleep, and mood swings. Hyperthyroid: Overactive thyroid. The thyroid produces excess amounts of T3 or T4, resulting in anxiety, rapid hair loss or alopecia, fine or oily hair and skin, rapid heart rate, hot flashes, inward trembling, weight loss, diarrhea, insomnia, and mood swings. In this two-part series, we’ll discuss each of these conditions in turn and explain how we test for and treat each condition at the BioDesign Wellness Center in Tampa, Florida. In this first part, we focus on the diagnosis and treatment of hypothyroid. In Part 2, we shift the focus to testing and treatment of hyperthyroid. Think of the thyroid as the body’s master control. Every cell in the body requires thyroid hormone to perform its metabolic function. This is one reason why people gain weight with hypothyroid, even with a reasonable diet and exercise. It’s also why those with hypothyroid can be so tired all the time — they often lack the motivation to move or to do anything at all. Clinical signs include elevated cholesterol, high triglycerides, insulin resistance, and anemia. Unfortunately, in the conventional health care system, patients often suffer with hypothyroid for quite some time, often many years, before the condition is diagnosed or treated. During that time, patients are often subjected to less-than-effective treatments for the symptoms, including prescription and over-the-counter medications as well as weight loss programs and fad diets. For example, patients are often prescribed antidepressants, weight loss medications, cholesterol lowering drugs, laxatives (for constipation), and various painkillers. All along, treating the thyroid would have been more effective without exposing the patient to the negative side effects of those medications. Better yet, when the root causes of their hypothyroid are treated, people begin to feel much healthier and more vibrant. 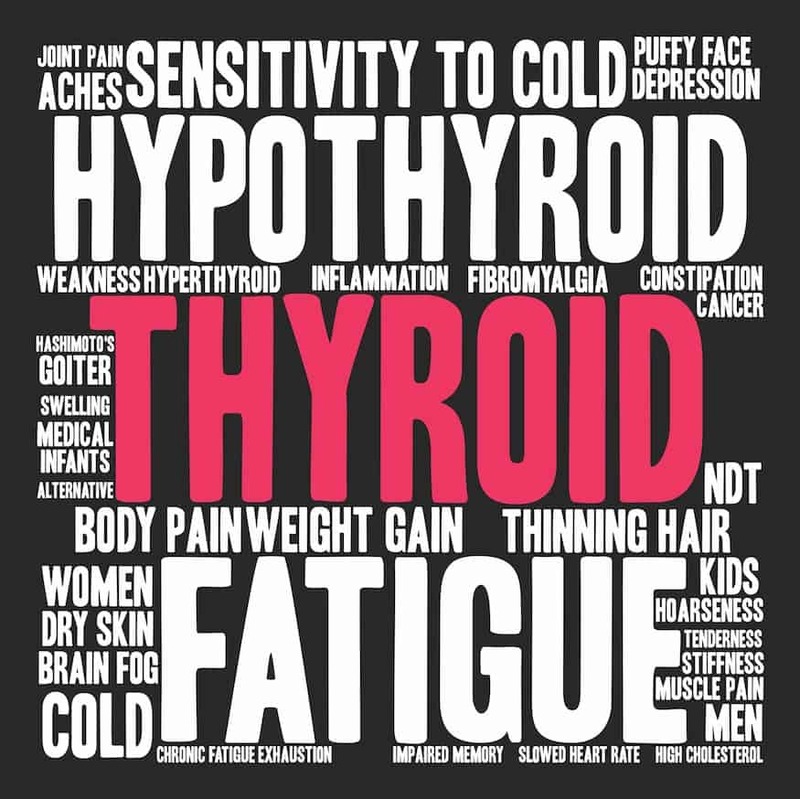 The conventional diagnosis and treatment model for hypothyroid is to test the levels of T3 and T4 and then prescribe thyroid medication, such as levothyroxine or Synthroid, if necessary, to make up for any deficiencies. These prescriptions can be helpful for some, but many people experience the same old symptoms soon after they start taking the medication or several years later. In other words, you could be taking thyroid medication as prescribed by your internist or endocrinologist, and your TSH, T3, and T4 levels may appear normal, but you may still feel miserable and continue to experience other symptoms of hypothyroid. And you would not be alone. We see many patients receiving conventional treatment who continue to experience symptoms of hypothyroid. The conventional approach to hypothyroid diagnoses and treats the cause of the symptomsbut stops short of diagnosing and treating the cause of the hypothyroid. Most hypothyroid problems can be traced back to an autoimmune disorder in which the immune system attacks the thyroid. This disorder is often referred to as Hashimoto’s thyroiditis. Type 1 diabetes mellitus: The body produces little or no insulin, or the insulin produced does not work as it should (insulin resistance). Graves’ disease: The thyroid produces too much thyroid hormone (hyperthyroidism). Rheumatoid arthritis: A chronic inflammatory condition affecting the joints, including those in the hands and feet. Pernicious anemia: The inability to absorb vitamin B12, potentially causing anemia and neurologic problems. Addison’s disease: Adrenal failure; the adrenal gland provides cortisol to handle stress and illness. Premature ovarian failure: Early menopause. Vitiligo: Patches where the skin loses its pigmentation. Thrombocytopenic purpura: A bleeding disorder due to inadequate platelets in the blood. Systemic lupus erythematosus (SLE): An autoimmune disease that can affect the skin, joints, heart, lungs, kidneys, and other organs. Conventional doctors may adjust a patient’s thyroid medication dosage, but they rarely explore causes, offer dietary advice, or warn the patient of possible autoimmune triggers that should be avoided or corrected. Genetics: If your mother has or has had hypothyroidism, you have a 50 percent chance of developing it. It’s especially prevalent in women in their 50s and older. Triggers: Triggers include stress, physical trauma (such as a motor vehicle accident), infection, hormone fluctuations in pregnancy and menopause (and sometimes puberty), certain medications, toxic environments, chronic mold exposure, and pituitary gland dysfunction. A variety of infections can contribute to hypothyroidism, including Epstein-Barr virus (EBV), Lyme disease, or small intestinal bacterial overgrowth (SIBO). While nothing can be done to address the genetic vulnerability, you can lessen the impact of the triggers and treat the underlying causes of the autoimmune disorder. Conduct a physical examination and carefully review the patient’s history. Thyroid dysfunction can be caused by physical trauma, certain medications a patient is taking or has taken in the past, exposure to environmental toxins, poor stress management, and so on. A physical exam and patient history often provide the clues to what we need to test for. Order tests for underlying cause(s) of thyroid dysfunctions, such as SIBO, EBV, Lyme disease, chronic mold exposure, and hormonal changes. These tests will vary considerably based on the initial evaluation. Order baseline testing on all thyroid markers including antibodies. This testing reveals any dysfunction that may be causing the immune system to attack the thyroid. Perform a sonogram of the thyroid. A sonogram can help to identify whether the thyroid is inflamed, nodular, or has shrunk. We often diagnose Hashimoto’s thyroiditis through a combination of lab testing and sonogram on patients who had been living with hypothyroid for years and were unaware of it. Test for nutrient deficiencies that may be contributing to fatigue and low energy. Review and adjust the diet to reduce inflammation in the gut, heal infections, reduce mold or yeast load, and balance blood sugar, specific to the patient’s labs and clinical findings. Restore healthy balance of gut microbes and repair leaky gut / intestinal permeability. Provide nutrient supplements to support proper thyroid function. Use immune modulation supplements to calm the attack on the thyroid, while monitoring thyroid antibodies and conducting sonogram studies. Follow up with bi-weekly or monthly visits to ensure treatment is working and make any necessary adjustments as healthy thyroid function is restored. Support with appropriate thyroid hormones. Some patients need T3 but are only taking T4. Many others need to adjust their dose of T4. Treating the underlying cause(s) may result in a need for less (or no) medication, so T3 and T4 supplementation must be carefully monitored and adjusted accordingly. Proper treatment of hypothyroid requires more than merely supplementing T4 and T3 when levels are low. An accurate diagnosis is necessary to determine why the thyroid is not producing/releasing sufficient thyroid hormones, and then treatment must address the underlying cause(s), whether it is Hashimoto’s thyroiditis, physical trauma, medications, pituitary dysfunction, or chronic inflammation. Whether you see a conventional or functional medical doctor, keep in mind that diagnosis is the key to proper treatment, and make sure your doctor tests for thyroid antibodies to determine whether the cause of your hypothyroidism is an autoimmune disorder or something else. Until you know the cause, you are merely treating the symptoms. The people we treat with symptoms of hypothyroid see vast improvement in their quality of life, including weight loss, increased energy, more restful sleep, less pain, and clearer thinking. Tune in next week for Part 2 of this two-part series (Restoring Thyroid Health: Part 2 — Hyperthyroid) to find out more about hyperthyroid and its proper diagnosis and treatment. Disclaimer:The information in this blog post on hypothyroidism is provided for general informational purposes only and may not reflect current medical thinking or practices. No information contained in this post should be construed as medical advice from the medical staff at BioDesign Wellness Center, Inc., nor is this post intended to be a substitute for medical counsel on any subject matter. No reader of this post should act or refrain from acting on the basis of any information included in, or accessible through, this post without seeking the appropriate medical advice on the particular facts and circumstances at issue from a licensed medical professional in the recipient’s state, country or other appropriate licensing jurisdiction.